View More In French Presses - Page 6. Frieling French Presses Win 2017 Housewares Design Award. An independent panel of judges selected the Frieling French Presses as the winner for its superior design, appearance, function and originality. Frieling's French Presses feature a patented dual filtration system combining a pre-filter and an exclusive super-fine screen for better coffee. The screen catches coffee grounds that may have passed through the pre-filter, eliminating bitter aftertaste and sediment in the cup. A stainless steel ring inside the coil prevents grounds from bypassing the filter. A tribute to simplicity, style and smart design, these models are double-wall insulated to retain heat up to four times longer than a glass press. A favorite in hotels and restaurants, these best-selling Frieling French presses are virtually unbreakable thanks to double wall 18/10 stainless steel construction. The double wall design keeps coffee hot 4 times longer than glass. It is perfect for brewing tea or serving cold beverages in the pitcher. You can make delicious coffee in just 4 minutes and all of the components are dishwasher safe. 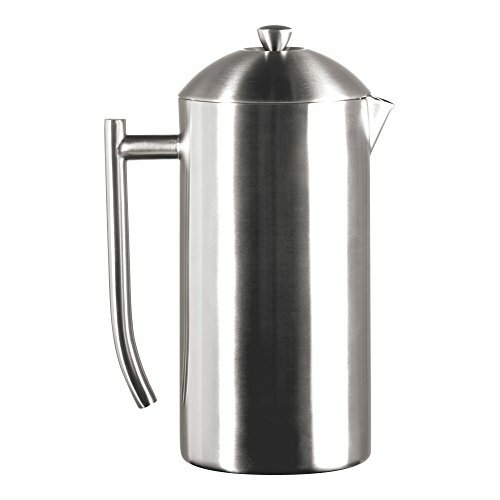 This double wall brushed stainless steel French Press holds 44 ounces and measures 10.25 inches high. It disassembles easily for washing, is dishwasher safe and has 5 year warranty against manufacturing defects. Replacement parts are available . If you have any questions about this product by Frieling, contact us by completing and submitting the form below. If you are looking for a specif part number, please include it with your message.